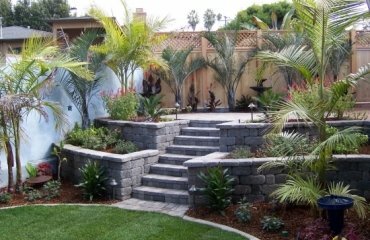 A good garden and patio design should follow the wishes and needs of the homeowners. The authentic natural look is very popular and is often the target of many designers. 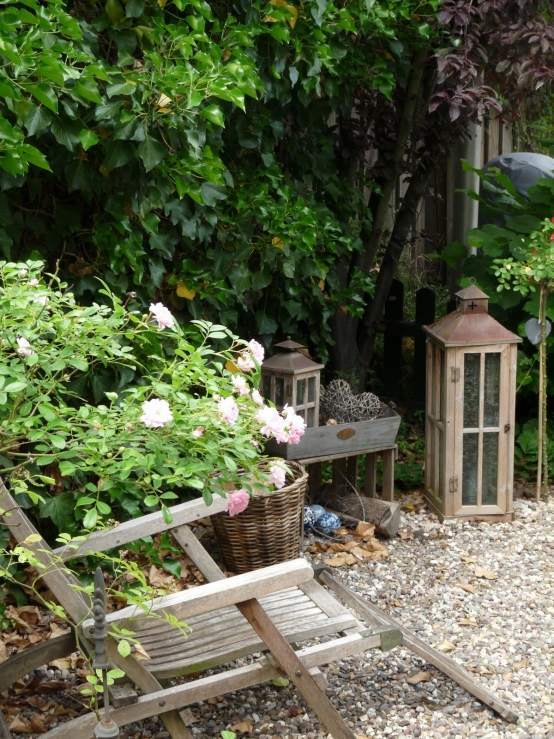 The garden is a cozy place of calm and relax with a micro climate that affects particularly well the human health. As an example we give the Japanese garden art which rests on the four-element theory. If you considered it seriously, one comes to the conclusion that the garden actually combines all four basic elements – air, earth, water and fire in him. 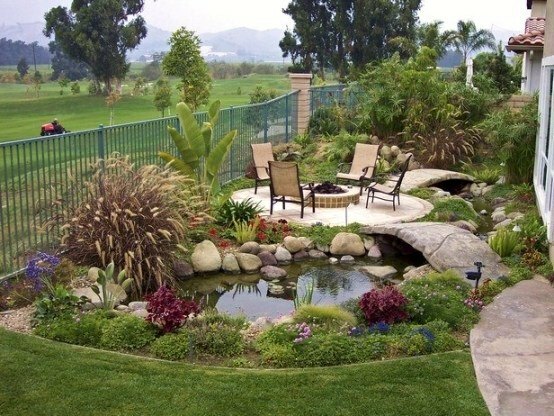 A fire pit symbolizes the element of fire, the small or large ponds that are modern lately, are bringing the element of water in the garden. In addition, it is the perfect retreat, where you can soak up energy for body and soul. 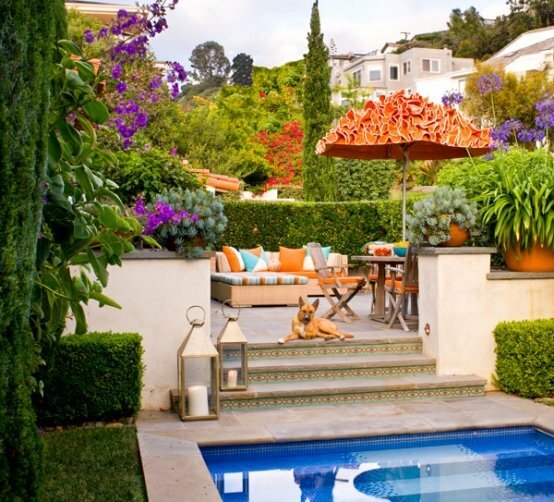 For these reasons, the design of the outdoor area is so important. 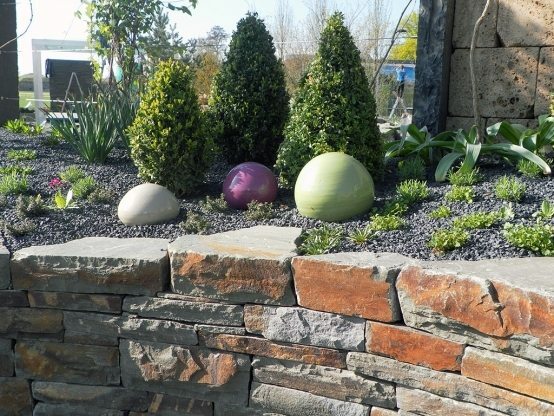 In this article you will find detailed information about the most important elements of garden and patio design – easy-care furniture, patio flooring, garden accessories, perennials and shrubs, and a few easy ideas on how you can fully equip your outdoor area and decorate it. 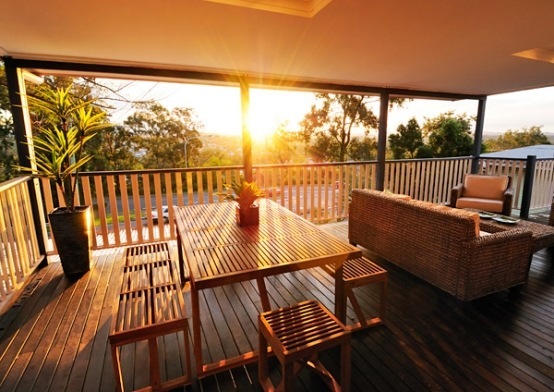 The basic elements from the interior of the house are particularly attractive in the patio design. 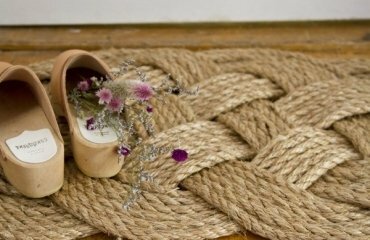 You could follow a particular color scheme for interior and exterior decoration or extend the flooring from the living room to the outside. If all the doors and windows are open during the warm summer days, the border between the two areas seems to disappear. First, you have to think about the seating. 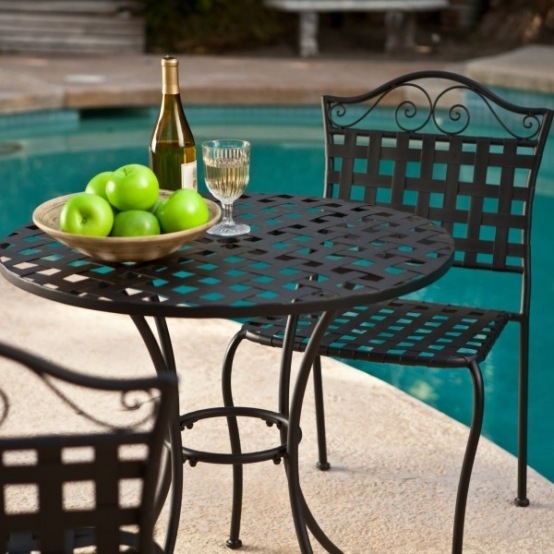 For the outdoor design garden furniture made ​​of wood, aluminum, stainless steel or plastic, depending on taste, is suitable. The dining area is included in almost any patio or porch. In addition, the chairs and tables are the most important pieces of furniture. A cozy patio can be arranged with a sitting area. 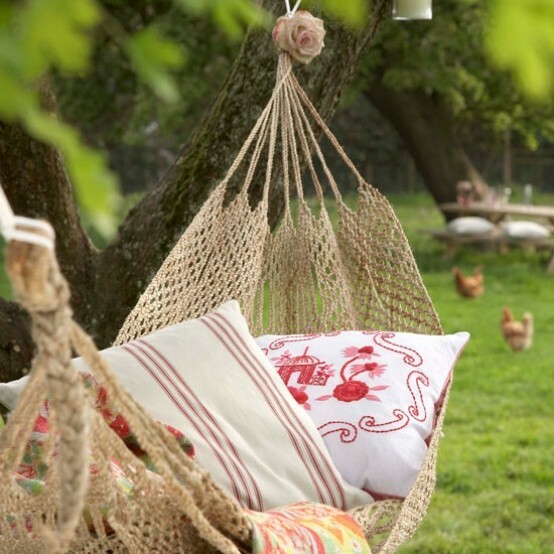 A hammock can be the focal point of the garden and provide additional unconventional recovery. Deckchairs in a minimalist style add identity to the pool area. The appropriate sun protection for your patio is essential. 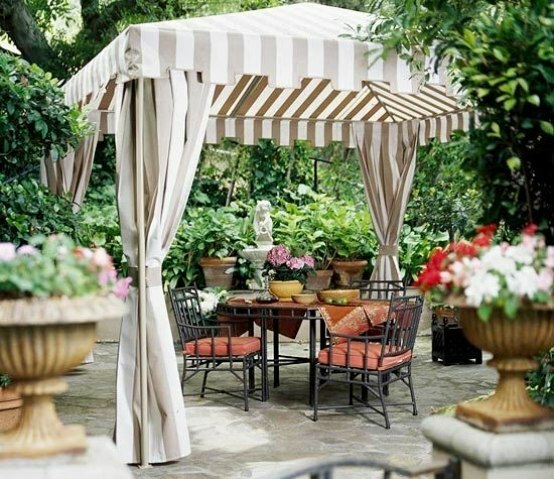 Umbrellas, canopies, awnings and pergolas are the classics. Some offer additional rain and wind protection, while others are compact and portable and can be adapted to the needs of the people. Most can be easily assembled. 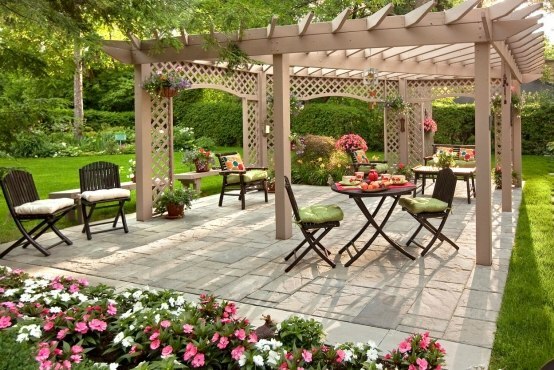 The garden gazebo is a beloved entertainment zone. 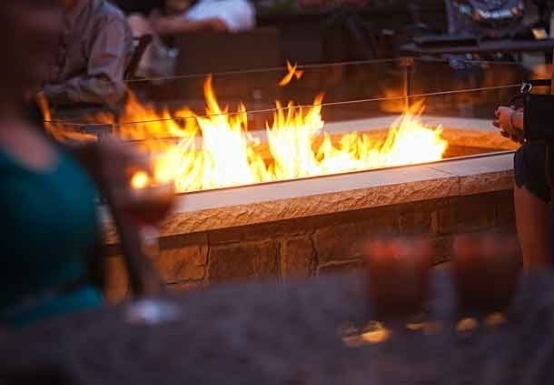 Since the prehistoric era, people gather around the fire pit. The appealing effect of open fire on people can barely be described. It symbolizes the natural element of fire. 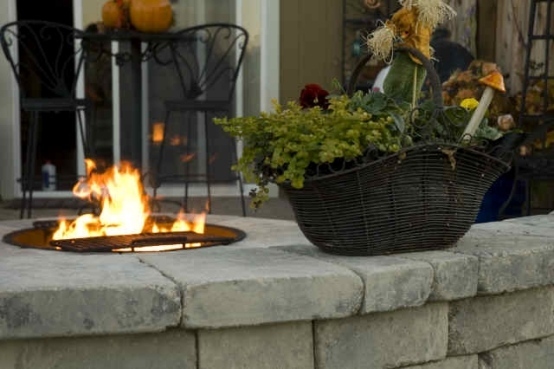 Today, the fireplace is more a decoration for the patio, than a place for cooking or heating. 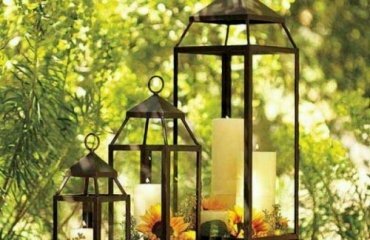 If you want to bring the element of fire in the patio design, you could set up beautiful candles and candle holders or garden lanterns. They create a warm and inviting atmosphere. For the colder days, one should think in advance of heating. 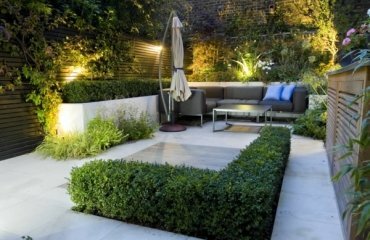 The modern outdoor heating systems (gas or electric fireplaces) are a good addition to the outdoor design and are sufficient for a radius of 20 meters. 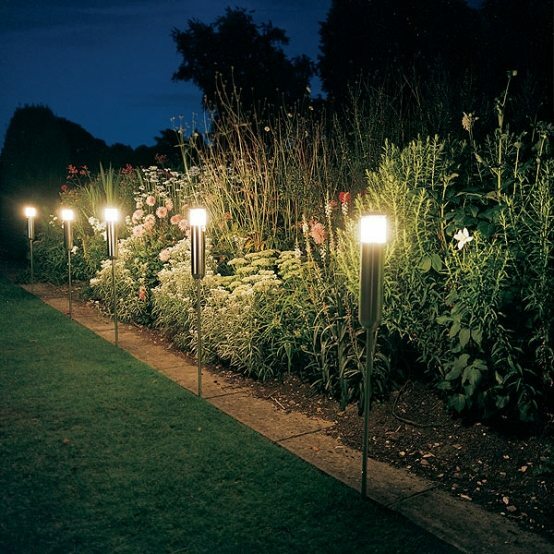 Decorative outdoor lighting gives the outdoor space a dramatic character. 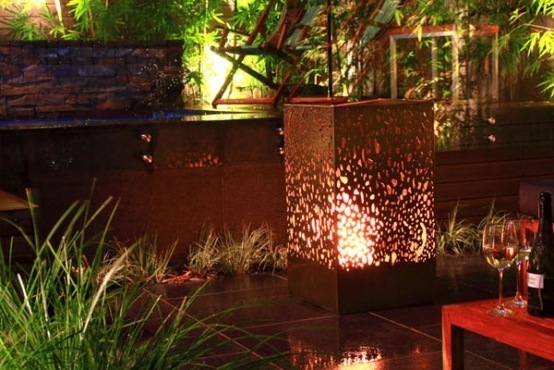 Any type of lighting is a great asset to the garden and patio design. The lighting adds splendor and magic to the ambiance of the night, but it is also important for safety. No one wants to stumble in the dark. 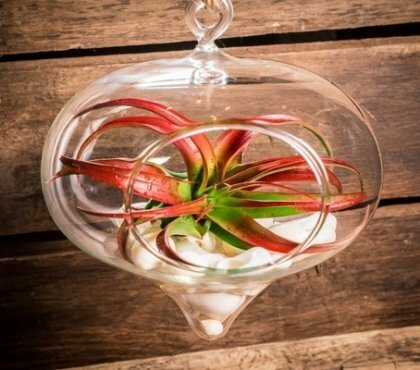 We offer you some ideas for outdoor decoration. 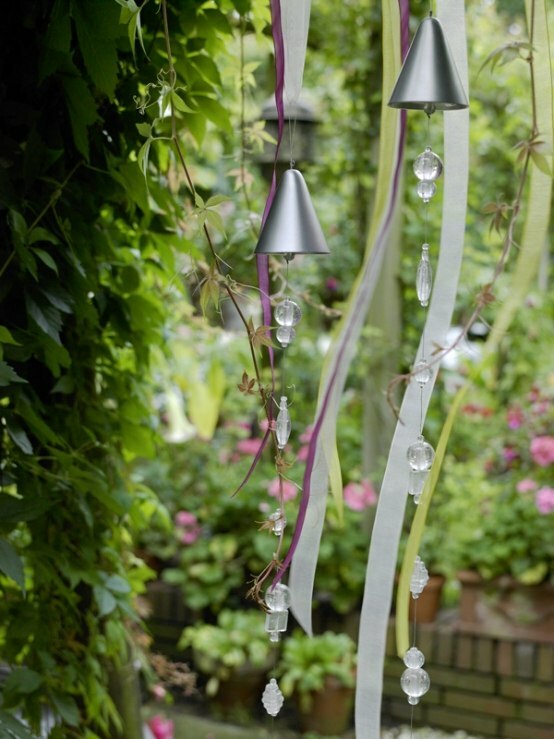 Wind chimes have therapeutic effect. They create interesting tunes when the cool breeze blows. 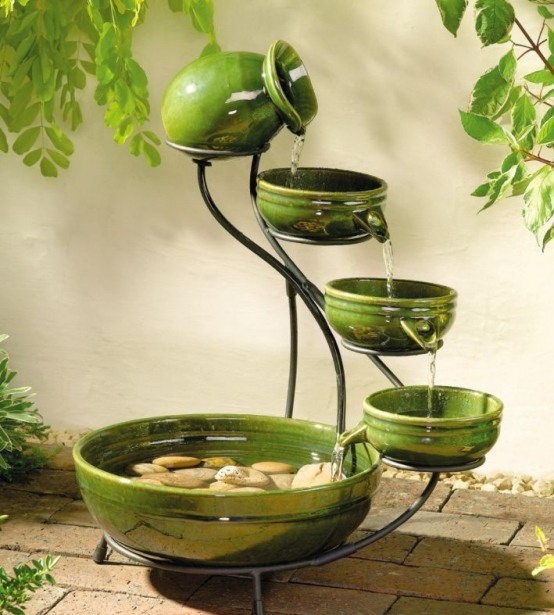 Water features soothe the soul. Whether it is a large waterfall or a small fountain that soothes the heart and mind with the sound of rushing water. Larger water features are also louder, but that is good because sometimes they are louder than the road noise. The ponds are also very popular. 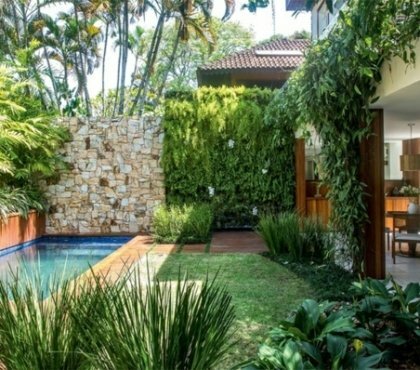 Greening is necessary for the beautiful patio design. 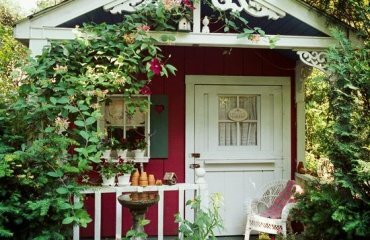 However, the beautiful flower pots, flower beds and shady trees harbor insects. In addition, you have to think for a mosquito net or insect repellents and lotions. But nature is also the best source of insect repellent. 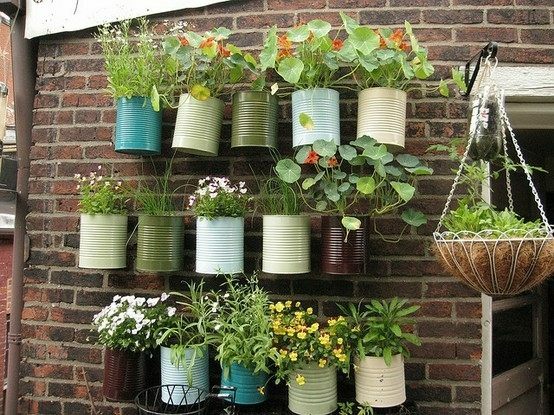 There are a number of flowers and herbs to keep the insects away – basil, peppermint or lemongrass. Some candles are found in the shops with the same properties. The natural enemy of insects are the birds. So, if you could build more bird feeding houses and enjoy the chirping of birds. 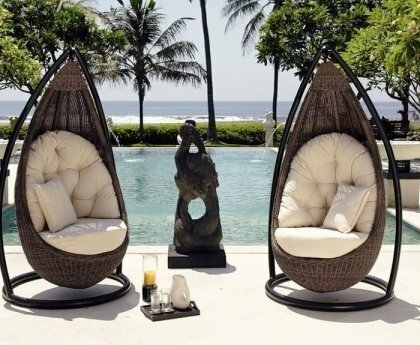 In the first place – it is the outdoor styling and decoration. Then comes the essentials for the perfect atmosphere. On warm fall days or sunny summer days a refreshing drink is the best. So get yourself a fridge or a thermo mug. If you want a romantic mood – it is easy to create it. With the help of a water mist machine, you can create a cooling sensation and reduce the temperature in the immediate vicinity. 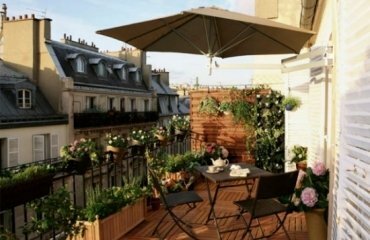 Since the terrace is an additional outdoor room , you often have a great view of the neighboring houses or the city landscape. 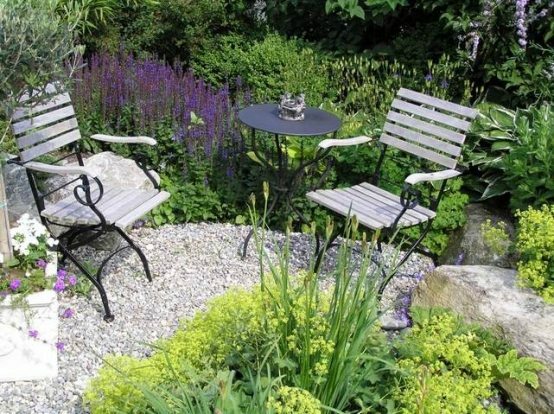 But if you have a beautiful view from the garden, you need to arrange all the furniture and accessories so that they are not an obstacle in front of the viewing angle. Finally, there are terraces, designed only for utmost convenience. Create your retreat as comfortable as possible. Lay a romantic stone path from the house to the patio. 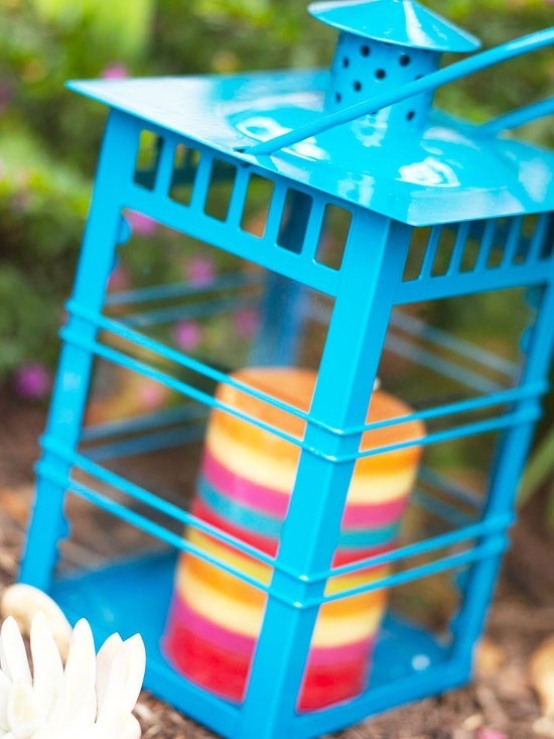 Define a barbecue area near the patio and leave a little free space where children can play. 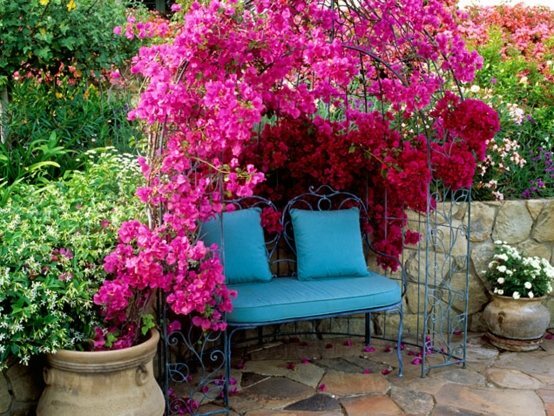 The garden furniture would look much cozier when lined up with colorful pillows or blankets. If you have already arranged all the furniture pieces, the only thing that remains is something for the romantic atmosphere – the music. The pleasant sounds of jazz or modern pop arrangements can get you into a dream world.